Leading up to the delayed release of Windows 1995, Microsoft was pushing hard to roll out its new MSN online service as an AOL killer. While some within the company--particularly J. Allard--urged the adoption of the web and Internet standards, MSN manager Russell Siegelman decided to instead to focus on MSN as a proprietary alternative to AOL that did one thing AOL didn't: ship bundled with Windows. AOL had to cover the planet with free diskettes with its online software; Microsoft planned to simply dump its own online software on the Windows 95 desktop and grab the entire online services market for itself. It was too late to shake down AOL however. The real movement online was in the open web. As Microsoft discovered this in mid 1995, it rapidly turned its online strategy around. Microsoft licensed web browser technology from Spyglass--a parallel commercial spinoff of the NCSA Mosaic project--to develop Internet Explorer as its own browser in order to destroy Netscape as a threat. 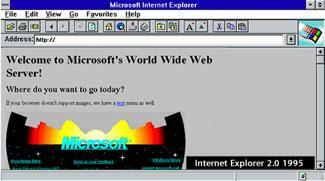 Microsoft invested significant resources into IE, outpacing Netscape both in development and marketing. It not only bundled IE with Windows--in violation of its earlier consent decree--but also used its marketing clout to push dialup ISPs to distribute IE instead of Netscape. Just like Microsoft, Netscape's strategy was to lock up the browser market and tie web development to its own non-standard extensions to HTML, in order to push the adoption of its own web server software. That resulted in a product that was really no better for consumers and businesses than Microsoft's IE. 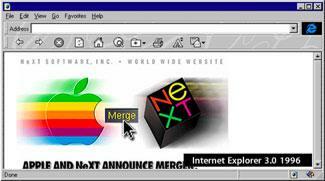 Starting in 1997, Netscape's ongoing development plans began falling apart. Its engineers were conflicted about whether to continue development of the top-heavy and increasingly problematic Mariner code-base used through Navigator 4, or to start over with an entirely re-architected new web rendering engine named Gecko. Netscape ended up doing both. First, Navigator 4 was replaced with a suite of products called Communicator 4, which tacked on an email client, a newsgroup reader, an address book, calendar, collaboration tools, a push client, and an HTML editor. Netscape's aging, bloated browser was now plagued with a series of marginal companion products that nobody really wanted. Communicator was trying to compete with Microsoft by becoming the user's entire desktop. After a brief fling with AOL to create a parallel online universe called eWorld between 1992 and 1994, Apple discovered the web too, and delivered Cyberdog (below), a suite of Internet tools —a web browser, ftp client, news, and email services —built as OpenDoc application components. Cyberdog was largely a demonstration of the potential of OpenDoc. As such, it demonstrated that OpenDoc was a solution to a problem that did not really exist. Nobody wanted to assemble components; they wanted regular apps. While CyberDog promised to replace the monolithic, bloated code in suites like Netscape's Communicator with smaller, faster components, the system had to load support libraries that effectively erased any intended benefits, ending up slower and fatter that what it hoped to replace. As a strategic battlefield in the war between Netscape and Microsoft, Apple had the luxury of not really needing to develop its own browser for the Mac. 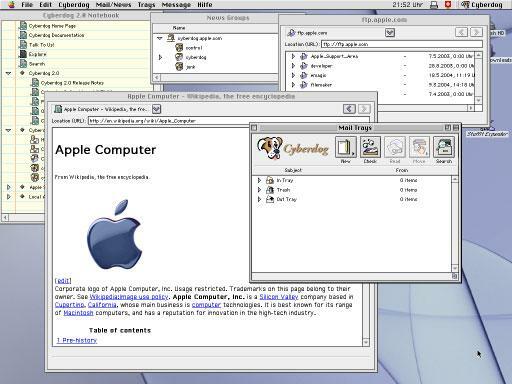 As noted in Mac Office, $150 Million, and the Story Nobody Covered, Microsoft used the threat of delaying Office for the Mac to sign a 1997 deal with Apple to force Netscape off the Mac desktop and therefore handicap Netscape's efforts to provide a cross-platform browser. After rapidly gaining web browser market share in 1997 as the default Windows browser, Microsoft introduced a variety of initiatives to tie all web-based development to Windows and proprietary features of IE. Microsoft similarly worked to link Java development to Windows and the IE browser, killing interoperability for both Java and the web, effectively nullifying both as cross platform alternatives to Windows-centric development. 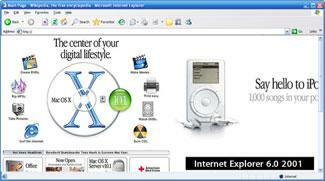 In 1998, Netscape dropped its original plans to deliver Netscape 5 as significant revision to Communicator 4. Instead, it chose to freeze development of the classic Mariner engine and instead launch a new open source project called Mozilla to deliver the new Gecko rendering engine as an open source project. That ended up taking much longer than originally anticipated. 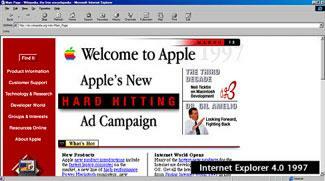 In 1999, AOL paid $4.2 billion for Netscape, hoping to use its new browser as a platform for modernizing the AOL service from a proprietary system of custom content to a web-based one. That business plan was complicated by the problematic ongoing development of the new Gecko-based browser. Desperate for results, AOL pressed the Netscape team to ship Mozilla's beta code as Netscape 6 in 2000, resulting in public embarrassment and further associating the Netscape brand with incompetence. In comparison, Microsoft delivered progressive new releases of IE in 1997, 1999, and 2001 (below), leapfrogging Netscape in innovative new browser features. Netscape only gave consumers and business users a choice between an old, buggy, and slow Communicator 4 and the unfinished, buggy, and slow Netscape 6. Microsoft quickly took over the entire browser market, both on Windows and on the Mac. 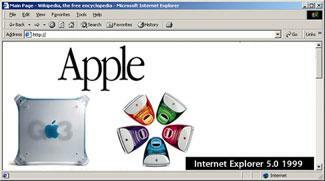 With no further need to compete or innovate, Microsoft subsequently dropped IE for the Mac platform and did not release another major revision on Windows until late 2006, five years later. In 2003, AOL decided to shut down the remains of Netscape entirely. Since the Mozilla Organization was mostly made up of Netscape employees, Mozilla as a project had to quickly learn to swim or die trying. Much like Apple in 1997, Mozilla in 2003 had to jettison its grandiose —yet ultimately deadweight —architectural fantasies and get busy developing and delivering products real people might actually want to use. Mozilla's Gecko rendering engine rose from the Netscape ashes under the name Phoenix, then Firebird, then Firefox in a series of squabbles over the project's name. Once that was sorted out, Mozilla developers began copying the success of the original Netscape browser from a decade prior by releasing regular, innovative, and free updates to Firefox. The popular Apache web server had also descended from the NCSA Mosaic server, although instead of becoming a commercial spinoff like Netscape or Spyglass, it became an open source project curated by the Apache Software Foundation. Unlike Netscape, Apache's dominant position in web servers was never overtaken by Microsoft. After AOL pulled the plug on the Mozilla Organization by laying off or reassigning all of Netscape's remaining employees in 2003, Mozilla reorganized as the non-profit Mozilla Foundation, much like Apache had. In 2005, this foundation set up the Mozilla Corporation as a wholly-owned subsidiary to allow it to earn revenue on commercial partnerships. Mozilla is now supported almost exclusively by its contracts with search engines. The Firefox browser is primarily aligned with Google, which pays Mozilla for the default direction of search engine requests to its servers. Around 95% of the $52.9 million in combined revenues of the Mozilla Foundation and Mozilla Corporation come from search engine agreements. Firefox has grabbed back a steady increase in market share, and currently has about 15% of the browser market. That consistent growth forced Microsoft to respond with the release of Internet Explorer 7 in 2006, after five years of no new major updates to its browser. On page 3 of 3: Apple Launches Safari; and Safari 3.0 on Leopard.